AUSTIN, TX - After a dramatic qualifying session at The Circuit of The Americas, Sebastian Vettel grabbed a last gasp pole with an amazing last lap. After yesterday's practice sessions dominated by missing helicopters and fog, todays qualifying was dominated by changing track conditions, driver attitudes and... oh yes, Red Bull. Hot, cold, sunny, cloudy, dusty, windy, a lot for a delicate Formula One car to have to deal with. Yet those were the conditions given to the drivers during todays qualifying session. Those conditions played a big part throughout the three qualy sessions. Q1 started with most teams opting for the grippier option tyre in warm sunny conditions. Jenson Button started this session knowing he has a 3 place grid penalty after passing under yellow flags during yesterdays practice sessions. He needed a good qualy session. Lewis Hamilton also needed a good session after recent chassis problems had hampered his last two qualification days. 4 minutes in and Sebastian Vettel looks very relaxed as he stands by his car listening to music. Not a good sign to the other teams and drivers. 7 mins in and Lewis radios his team "The track is slow". A reference to the dust and gathering wind sweeping across the track playing havoc with the amount of grip he was receiving. With 8 mins left in Q1, Vettel eventually comes out on the harder Prime tyres to set some lap times. 2 mins left sees Lewis put a great lap in also on primes to go P1. Meanwhile Pastor Maldonado, soon to be vacating his Williams seat, records a slow time that will see him going out and qualifying in 18th. More about him to follow. The six drivers to go out of qualifying at the end of Q1 were: 17th Sutil, 18th Maldonado, 19th Van Der Garde, 20th Bianchi, 21st Pic, 22nd Chilton. Suprisingly Valtteri Bottas tops the timesheet at the end in P1. Q2 starts under clouds and slightly cooler temperatures. Ferrari drivers struggle with the conditions and Williams bound Felipe Massa goes out. Another shock exit from qualy was Nico Rosberg who also went out and qualified in 14th position. Bottas put in another great performance and finished 4th overall. Red Bull dominated though and Vettel finished P1 and Mark Webber P2. With so many Mexican fans here supporting Esteban and Sergio Perez, Perez beats his team mate Jenson Button into the top ten shoot out and makes a point to his McLaren team that has terminated his contract for next season. As the session progresses, Mark Webber sets the fastest time with a great lap of 1min 36.699. Lewis Hamilton could only manage 5th. With an amazing last sector time on his last lap this years world champion Sebastian Vettel grabs pole in the dying seconds of the qualifying session. So, the top ten grid is as follows; 1st Vettel, 2nd Webber, 3rd Grosjean, 4th Hulkenberg, 5th Hamilton, 6th Alonso, 7th Perez, 8th Kovalainen, 9th Bottas, 10th Gutierrez. Great drives by Bottas and the returning Heikki Kovalainen but Rosberg, Maldonado and Button have a lot to do in tomorrow`s race. After he went out, Pastor Maldonado hinted that someone may have interfered with his car`s set up. To even suggest that a top F1 team would allow that to happen while scrapping for all important world championship points is an absolute disgrace. He may bring a lot of money with him but he doesn`t bring a lot of class. Vettel put in an amazing last gasp qualifying lap to grab pole. Can anyone stop him winning the last two races this year? Enjoy the race! 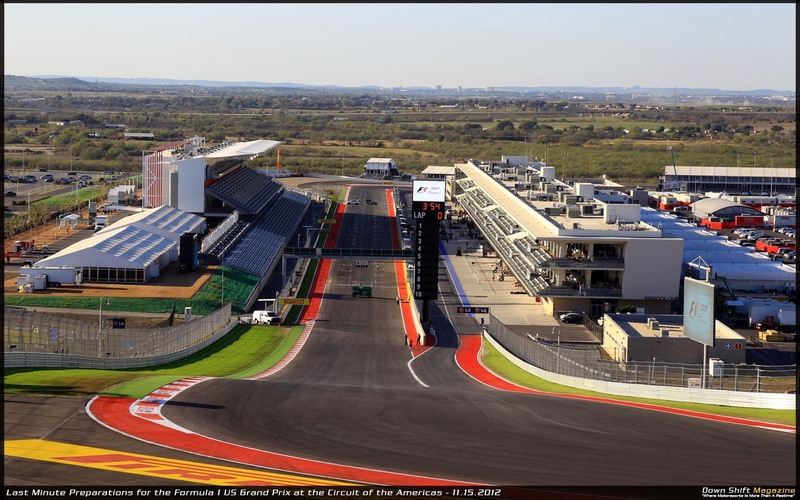 Full qualifying reports and coverage for the 2013 American Grand Prix. F1 on TSM.